Forgings and flanges manufactured under the highest quality standards: Western of Texas Forge and Flange Co.
Western of Texas Forge and Flange Company maintains a full Quality Control / Quality Assurance Program that ensures complete traceability of all products, whether in raw, forged or finished form. Our Quality Management System is certified to ISO 9001-2015 by DNV - GL, and HSBC compliant to CSA B51 (CRNs) Certification. Our products are manufactured in accordance with ANSI B16.5; B16.36; B16.47; and MSS-SP-44 in addition to industry and statutory standards as required. All markings are as per MSS SP-25. Each forging is hot stamped, marked with the material type and heat code number and inspected both before and after machining. A final inspection of markings and dimensional accuracy is performed before packaging for shipment. Inspectors conduct the entire quality control process. Western of Texas maintains full traceability of all our products from the raw billet to the finished product. Mill Test Reports and Certification of Compliance are available to any purchaser. 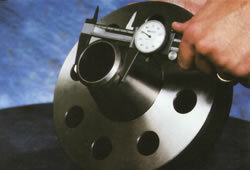 Each flange is permanently marked with the information necessary to easily identify the products we manufacture. Our identification markings are in compliance with American National Standards Institute requirements and appropriate American Society for Testing of Materials and American Society of Mechanical Engineers specifications. Our commitment to the Quality Process ensures our customers with the products and services they have counted on for over 25 years.